NOVEMBER RELEASE - AVAILABLE ON SEPTEMBER 20. 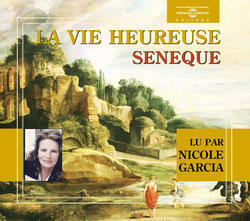 2-CD set features sensual French actress Nicole Garcia delivering an interpretation of Seneque's work "La Vie Heureuse" ("Happy Life"). Seneque, a famous philosopher in Rome during the 1st Century, elaborates a very human moral about what men have to do of their life to achieve the "piece of their soul". In French.